I love Great Blue Herons. I've been away on vacation for a couple weeks, with no art supplies with me, so my pastels have not been touched since mid-December. But I had a lovely time in Jacksonville, FL, spending Christmas with my son, daughter-in-law, and 15-month-old grandson. It was chilly early in my visit, with temps down in the 20s at night, and even light snow flurries the day after Christmas. But it warmed up as time went on, and reached up into the low 70s by my last couple days there. My little grandson woke up every morning about 6:30 AM and would come into my room to visit me, so those last couple days I put him in his stroller and took him for an early morning walk around their apartment complex, which surrounds a small lake. I always enjoyed seeing what birds might be at the lake, and the early morning was a great time to see herons and egrets. We saw this great blue backlit by the rising sun, and I just knew I wanted to paint him. I got a chuckle when I realized that he is not my first Great Blue Heron painting. 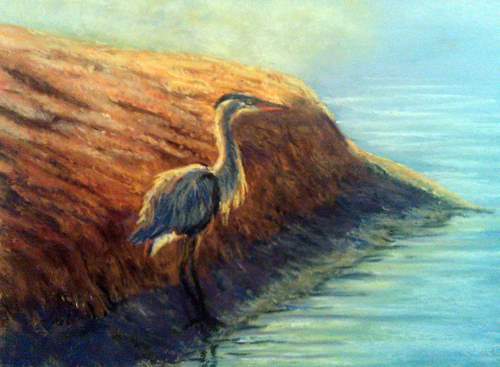 I did this blue heron painting just recently from a photo I took up in Canada back in October. Though my first one was this one from two years ago, where you can barely see that there is a bird, let alone its species, LOL. Lovely colors. You captured the light well.